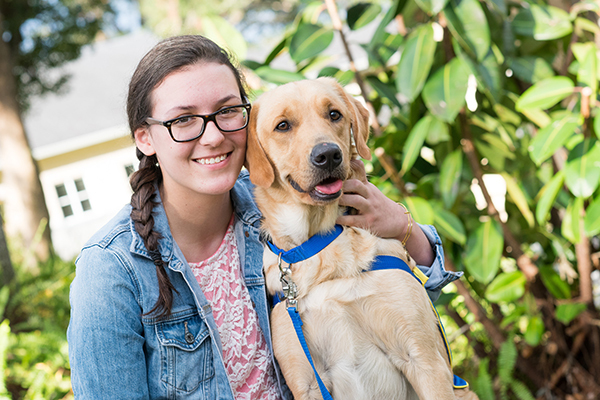 Maya Harlow, of Ozark, Ala., was named a distinguished finalist in the Prudential Spirit of Community Awards for her work as a volunteer puppy raiser for Canine Companions for Independence. Harlow, a senior at Carroll High School, volunteers to train and socialize Canine Companions’ future assistance dogs. She is mindful of the needs of people with disabilities and other challenges -- especially invisible ones, such as her brother's Type 1 diabetes. She wanted to be a puppy raiser to help provide the ears, mobility, independence and peace of mind for the people who need our assistance dogs. Adobe, the first dog she raised, now works with victims of sexual and domestic abuse in South Carolina. “Volunteer puppy raisers are the lifeblood of our organization and we are thrilled for the example that Maya is setting for young people to become more involved in our organization” said Ashton Roberts, the Southeast Region’s puppy program manager.